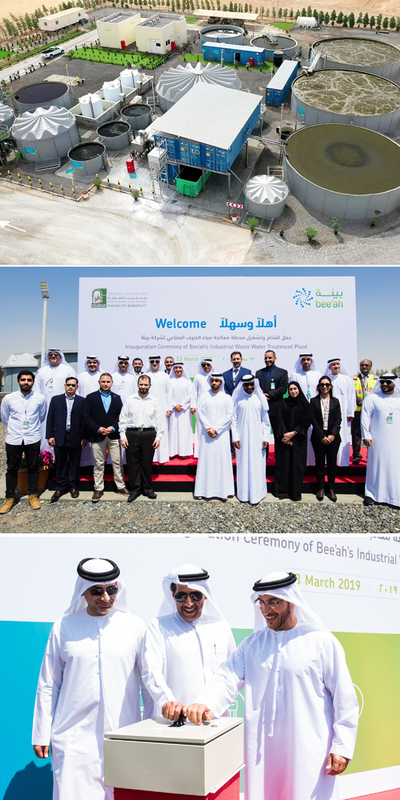 Bee’ah, an environmental management company, has announced the launch of its innovative industrial wastewater treatment plant, (IWWTP) in the northern emirate of Sharjah. The new plant at the company’s waste management centre in Al Saj’ah, signifies a new milestone in the country’s zero-waste journey, and will be one of the UAE’s first dedicated full-cycle treatment facilities for industrial and oil-contaminated wastewater, said a statement from Bee'ah. Processing a minimum of 300 cu m of wastewater daily, the IWWTP was established to treat industrially contaminated water and produce clean water that can be returned to the water cycle, with a minimum impact on the environment, it added. According to Bee'ah, the most advanced processes are being implemented in the plant which operates on an intricate five-tiered-system. Once the liquid waste gets collected in the reception area, it passes through a physical treatment stage to separate sand and remove floating fats. Then the water is pumped to a chemical treatment stage to adjust the pH and remove heavy metals respectively. After this, the biological treatment stage involves the removal of organic pollutants and a breakdown of ammonia. Lastly, the water goes through a multi-filtration stage, which includes ultraviolet (UV) filtration, to remove suspended matter and most forms of microbiological contamination, it added. The clean water thus produced from the plant has been certified to be safe for irrigation, remarked Salim Al Owais, the chairman of Bee’ah while speaking at the launch ceremony in the presence of Thabit Salim Al Tarifi, the director general of Sharjah City Municipality, Khaled Al Huraimel, group CEO of Bee’ah, and other senior dignitaries. "This plant will serve as a crucial link in our overall strategy for total diversion, consolidating our leadership in sustainability, and in wastewater treatment solutions specifically," stated Al Owais. "Industrial wastewater levels are on the rise in the UAE, with the manufacturing sector being a primary contributor to the country’s GDP," he added. "It is, therefore, a priority to find a sustainable solution for the treatment of such wastewater, as the economic production base expands," noted Al Owais. "As one of the only dedicated industrial wastewater treatment facilities in the region, the IWWTP presents a viable alternative to the disposal of industrial wastewater, turning it into a resource which can further our ambitions in sustainable development," he stated. Al Tarifi said: "With a waste diversion rate of 75 per cent set under the UAE Vision 2021, it is important for us to identify ways to reuse and recover the resources as much as possible."